La Perla Theater was constructed in 1864 according to the design of Juan Bertoli Calderoni, the Italian architect, designer and master builder whose remains rest in the National Pantheon Roman Baldorioty de Castro . As a matter of fact, Ponce owes its “Ciudad Señorial” nickname as Majestic or Noble City to this historic building. Upon its inauguration and enthused by the beautiful structure, prized local journalist of Spanish origin Manuel Fernández Juncos for the first time utilized the epithet by which the city is still know today. As with the rest of the town center, uniquely modeled on Barcelona’s architecture, the theater was designed with a distinct neoclassical style, boasting a large entrance with six impressive columns. Most of the building was destroyed during the 1918 earthquake that only left four of the columns (with its iron capital or crowns) intact. It was finally rebuilt in the early 1940’s with the original facade, by architects Francisco Gardón and Francisco Porrata Doria. Acoustics were improved as well as its richly decorated interior now able to handle audiences of up to 1047. The first event presented was “La Campana de la Almudaina” by Juan Palou y Coll, a Mallorcan drama that became very popular after its 1859 premiere in “El Circo de Madrid”. It was also selected as the first play to inaugurate the oldest theater in the Spanish region of Murcia (“Teatro Guerra”) back in 1861. In April 1896, Ponce native Juan Morel Campos, one of the most illustrious and prolific Puerto Rican composers, suffered a stroke while conducting the orchestra during a La Perla Theater presentation of “El Reloj de Lucerna”, a Spanish zarzuela (musical comedy) of his own, and died three weeks later. 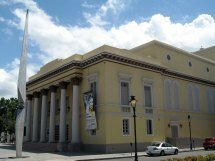 Ever since, La Perla Theater has hosted the most selected local and international events such as the Institute of Puerto Rican Culture and the Luis Torres Nadal theater festivals, as well as the Casals Music Festival. Its last major reconstruction took place in the 1990’s under the administration of the beloved and “eternal Ponce Mayor”, Rafael Churumba Cordero. 787.843.4080 – MON thru FRI (8:00am-4:30pm) – FREE ADMISSION.